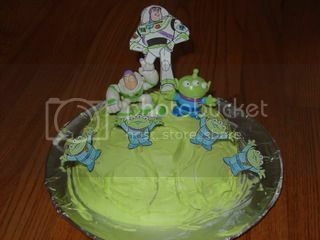 When my dauther turned 3 she stated whe wanted a Buzz Lightyear cake. Not just any Buzz Lightyear cake for this little Buzz fan who had been in love with Buzz Lightyear since the age of 18 months, But a Buzz Lightyear riding in a Spaceship cake. WOW that is a tall request. Yes I am creative but I would not call myself a cake decorator. But the best thing about kids cakes is that they don't have to be perfect. My cakes clearly are not, but I had fun making them anyway.. So first things first, how to find a spaceship. 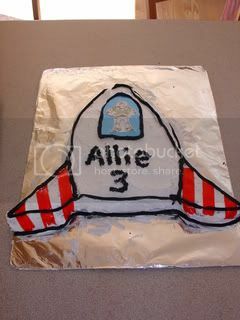 Well I happened across this one which is actually a rocket cake on the Family Fun site. I made my cake the same way except I didn't trim down the sides an inch like they showed. I didn't want to waste the cake, and yes theirs looks a bit better but I didn't care too much. Now to make it more Buzz like. Buzz has caracteristic red stripes on his wings when they are opened. I used Fruit Roll up to make the stripes on the wings of the rocket. Now to get Buzz Inside the Rocket... I found some online free coloring pages with Buzz Lightyear on them like this one. I printed out one I liked and colored Buzz in and cut him out. I placed him on some blue cardstock. (actually it was piece of a clothing gift box from The Children's Palce. It was the perfect color and I was reusing what I had.) Then I wrapped the cardstock with Buzz on it with plastic wrap to form a window so to speak. I placed it on the cake and piped black iceing around the edge of it. 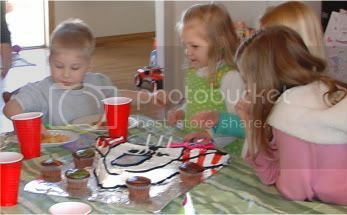 The cake was a hit with all the kids that came. Skip ahead a year and my girl now turning 4 was still Buzz crazy. So another Buzz cake was requested. This time we didn't as much cake that year so I made this one. I used a pirex bowl and sprayed it with cooking oil. Then baked the cake inside the bowl. When it was done I turned it onto the plate and decorated it to look like a planet. I used neon green food coloring to color white frosting. I used different sized cups we had in the house to make crators in the planet surface. I origonally planned on using the paper characters taped to toothpicks. (coloring pages again) but last minute my Daugher found some characters cheep at Toys R Us that she bought with her free birthday club gift card. So she wanted to toss those on there too.